White House To Dedicate Harvey Milk Forever Stamp On May 22nd. Home/Featured/White House To Dedicate Harvey Milk Forever Stamp On May 22nd. In a statement released Thursday The White House has said that it will dedicate the Harvey Milk “forever” stamp — on its first day of issue on May 22nd which is Harvey Milk Day in California. 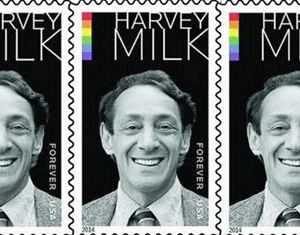 Milk will be the first openly LGBT elected official to be featured on a U.S. stamp. The stamp image is based on a circa 1977 black and white photograph of Milk in front of his Castro Street Camera store in San Francisco taken by Daniel Nicoletta of Grants Pass, OR. Antonio Alcalá of Alexandria, VA, was art director for the stamp. Harvey Milk was a visionary leader who became one of the first openly gay elected officials in the U.S. when he won a seat on the San Francisco Board of Supervisors in 1977. Milk’s achievements gave hope and confidence to the Lesbian, Gay, Bisexual and Transgender (LGBT) community in the United States and elsewhere at a time when the community was encountering widespread hostility and discrimination. Milk believed that government should represent all citizens, ensuring equality and providing needed services. Harvey Milk was assassinated, along with San Francisco mayor George Moscone, on Nov. 27, 1978. In 2009, he was posthumously awarded the Medal of Freedom by President Barack Obama. The public is invited to attend the May 28 Harvey Milk Forever Stamp special dedication ceremony in San Francisco. The dedication will take place at 3:30 p.m. at San Francisco City Hall, 1 Dr. Carlton B. Goodlet Place.